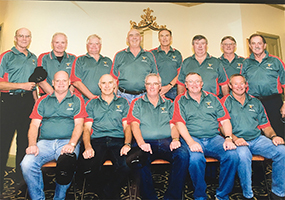 When John Coughlan stepped onto the cricket pitch in 1968 for college sport, he never imagined he and the young men he played against would be close friends for 50 years to come. Mr Coughlan studied a Bachelor of Economics at UNE and attended Wright College. On the weekends he played inter-college cricket, where he befriended students from other colleges. During Mr Coughlan’s time at UNE these friendships grew stronger, and in 1973 when he moved to Sydney to pursue his career, he found many of his UNE friends were making the same move. 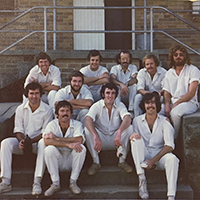 Soon after relocating to Sydney he met with a fellow UNE graduate Mike Muldoon, where they devised a plan to form a cricket team. After rounding up their UNE peers, they started the UNEX (ex-UNE) cricket team and played every Saturday in the Northern Suburbs Competition. Mr Coughlan laughed when reminiscing about the years the team saved money by replacing registered players with fill-ins. “On a particular occasion a fill-in player scored two centuries in two weeks, and the registered player’s name was prominently displayed in the North Shore Times as having achieved this success, can you imagine his reaction when he read the paper?” he said. In 1976 due to work commitments, family life and lack of time, UNEX retired from the competition. The withdrawal of the team did not affect the friendships forged, and they all remained close friends until they started an ‘over 60s’ cricket team thirty-three years later. The team played all over Australia and New Zealand, and although they won more often than not, for Mr Coughlan and the UNEX team it was about mateship more than the competition. “For us it’s about camaraderie and mateship,” Mr Coughlan said. In 2016 Cricket NSW enforced a rule that would see only state-based teams permitted to compete in the national Over 60s Championships. Although many UNEX players would qualify for the NSW Team, Mr Coughlan said "the concept of playing with mates overrode the desire to be successful." Despite the fact UNEX could no longer play in the national competition, they continued playing at yearly carnivals in South Australia, Victoria, Western Australia, New South Wales and New Zealand. In April UNEX will travel to Christchurch, New Zealand to participate in a ‘Golden Oldies’ cricket carnival. This might be their final game, but Mr Coughlan vows that the friendships will carry on beyond the cricket pitch, as it always has.